This article covers how to automatically switch between Windows 10 light and dark themes at the scheduled time. Microsoft Store, Calculator, Setting, Calculator, Microsoft Edge and other Windows 10 apps installed on your PC will be switched to dark theme and light theme based on the time set by you. This will be handy when you want to use apps with dark mode at afternoon or night and light mode in the morning. 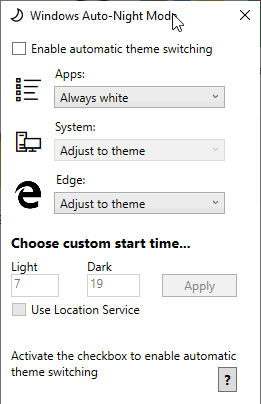 Though you can manually change from light theme to dark theme in Windows 10 using Settings, it is not helpful to change themes automatically. Therefore, a free software called “Windows Auto-Night Mode” will come in handy. It lets you select light/dark mode for Microsoft Edge and other apps and set the time for both the modes. Once the settings are applied, it will start doing the magic. One thing that I didn’t like is it doesn’t let you set minutes while setting the time. 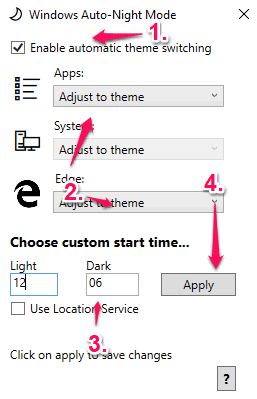 How to Automatically Switch Between Windows 10 Light and Dark Themes at Scheduled Time using This Software? This is a portable software which you can download using the link given at the end of this article. Execute the application file and its interface will be visible to you. Now select “enable automatic theme switching” option. After that, you can set light mode, dark mode, or theme mode for Windows 10 apps and Microsoft Edge using the available options. Finally, you can set time for Light and Dark themes. Separate boxes are available to set time for both the themes. Once you’ve entered the time, you can use the Apply button. The rest of the task will be completed by this software. We’ve also covered some free chess apps for Windows 10. Though you can manually switch between light theme and dark theme in Windows 10 and also use Task Scheduler to enable automatic switch, that would require a lot of steps and process is very lengthy. This software skips all that hassle. It creates a task by itself in Task Scheduler so that light and dark themes can be changed automatically based on the time set by you.